"St. John Paul II’s 1976 prophetic warning about the rise of an 'anti-Church" that would preach an 'anti-Gospel' is being fulfilled today by leaders within the Catholic Church, even at the highest levels, said a priest in a talk given at a Catholic conference today in Rome. 'This anti-Gospel, which seeks to elevate the individual’s will to consume, to pleasure and to power over the will of God, was rejected by Christ when tempted in the wilderness. Disguised as ‘human rights,’ it has reappeared, in all its luciferian hubris, to promulgate a narcissistic, hedonistic attitude that rejects any constraint except that imposed by man-made laws,' he said." For more than 30 years now, I have been warning anyone who would listen about the counterfeit church being fashioned in the image and likeness of man and subject to doctrines of demons. This church, the Mystical Body of Antichrist, has now become more open and therefore more visible under the pontificate of Francis. This church, a work of the Devil within the True Church, is manifesting itself with increasing intensity. 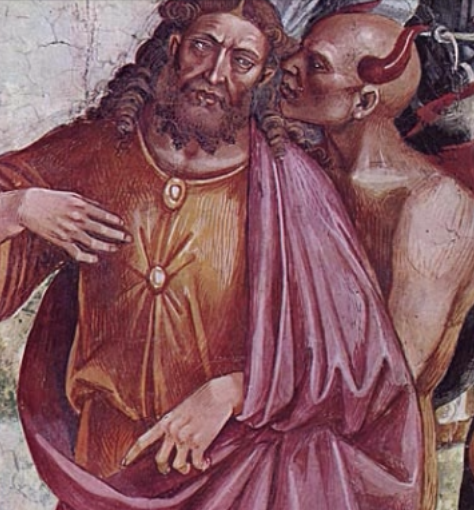 To those of you who are too blind or obstinate to believe this possible, I submit the following: In his book Communism and the Conscience of the West, Archbishop Fulton John Sheen warned that, "He [Satan] will set up a counterchurch which will be the ape of the Church, because he, the Devil, is the ape of God. It will have all the notes and characteristics of the Church, but in reverse and emptied of its divine content. It will be a mystical body of the Antichrist that will in all externals resemble the Mystical Body of Christ...Then will be verified a paradox - the very objections with which men in the last century rejected the Church will be the reasons why they will now accept the counterchurch." (pp. 24-25). I've been living in two different Islamic countries. Islam is the first 6 of 666, the last one is Masonry, they inflitrate the church via liberal Catholics...do NOT take them lightly.